Currently I feel like a dog chasing my own tail as I work on a lot of different rep gains per day. The downside of starting a game years after it launches is that you’re sitting on a HUGE amount of content you get to sift through and with Warframe that isn’t easy. There is a LOT to do in Warframe from the basics of just getting through the star-chart to grinding enough Mastery to unlock better weapons that’ll help you get THROUGH the star-chart with a lot fewer upgrades. Finding the right balance of funzies and completion is pretty tough. When you’re idea of fun is roaming alone over the plains havesting anything and everything, it takes a bit longer to work through the masteries and star-chart. BUT, because of my obsessive hunter/gatherer (and sometimes fisher) compulsions, rep for the open world map factions has gone quite a bit smoother than I’d anticipated. This way I can work on my Syndicate standing a little bit when I’m roaming those areas. That is when I’m not just getting any new warframe and weapon out of my foundry and taking it to the usual grind spots. 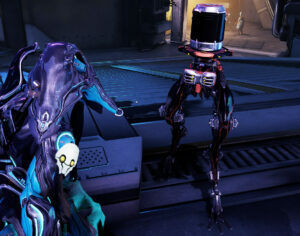 So far I have my first Zaw and a little MOA buddy I’m going to name Alfred (once I have enough rep to Gild him AND the Zaw… such fun). Fishing on the plains of Eidolon and mining out Orb Vallis have really made a big difference in making my daily standing cap with these factions rather quickly and banking extra rep for days that I just don’t have time for the grind. As for the Vent Kids, well that one is going to take longer since that one you have to actively grind that out daily. The one upside is that it doesn’t cost anything but time and effort to level it, so it’s toats worth it. That and the K-Drive is super useful as quick and easy transportation across the open world areas. You can’t use weapons with it like the Archwing launcher, BUT it’s super quick and a lot more fun to use. The animations are awesome sauce. Since I’m the K-Drive nut in the crew I pretty much have to wait until I have solo time to grind that out. Though doing rotations at The Pearl there in Orb Vallis has made that go a lot more smoothly. Especially for folks like me that can’t get 3,000 points in tricks just grinding along the pipes in Fortuna’s back yard. I’ve tried, but I think that it’s nearly impossible with the base board and I’m building my K-Drive not buying it. It’ll be worth the rep to have it exactly the way I want it. That and I hoard plat like a dragon hoards gold. I’m terrible I know. Don’t get me started on gnome punting. Hopefully soon I’ll be able to gild my Zaw and see what it’ll be able to do with “moar mods” and the like. I’ve been looking around through videos and the configuration I’ve set up seems to be a strong weapon. It’s pretty decent even without gilding so it’ll be fun to see what it can do once I can get that knocked out. I’m also working on a mighty bow collection since I’m trying to decide what I want to use on Ivara. I know I’ll be using the Dread when I want to do anything sneaky. It’s a great weapon. Downside is that it’s single target and I’m crappy at aiming. With stealth I’m not too bad though, but it does take a bit more time. I need the mod to speed up my stealth, but that’s another grind. I’ve had a lot of fun with Ivara and now she’s my go-to solo char. High damage, sneaky stealth and utility. She’s really fun for roaming the open world content at my own pace. I just think I’d need to invest in a LOT more damage and whatnot to make her viable for doing more types of mission running, but I’m thinking it’s possible. 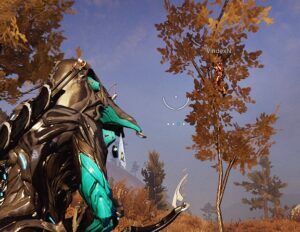 Ivara can also be fun to play with others. The little stealth bubble has made life on the planes a lot easier for Vinny and myself, even if he still stomps around on Rhino. We have a bit of the star chart to go. The problem is I still can’t decide which frame I’m going to work on first. See getting a frame to 30 is just the start. Customizing the frame for mods that require more resource, that takes time and it’s a serious investment. Right now I can’t decide between Ivara and Octavia. I usually end up playing Ivara a lot more lately. I have put a lot of work into my Trinity Prime and trin-tanking is quite a bit of fun, but it’s doesn’t give you that powerful feeling that the other frames offer, so she’s just chilling in the arsenal for the time being. While I do like Trinity, she’s a VERY expensive frame to fully kit out for end game. For me it’ll be a LOT more because I prefer playing the more tanky Bless type Trinity. So that’s shelved while I work on either Ivara or Octavia and probably beef up my Smeeta Kavat, Buffy. She’s having a hard time in the planes so she needs more modular love. That of course means that she’ll need to be polarized and releveled at least two or three times as well. JOY! Well time to go and get lost in Warframe. Until next time I plan on continuing my rep grind and trying out some different bows! Have fun out there.